Wondering if anyone can help. I have been having an issue with Videowave for a while now. After importing videos and photos into Videowave and editing them with crops and zoom in/out etc., they start to fade away and you cannot see the picture. It usually takes a day or two for them to fade out completely whereby you just cannot see what picture of video has been inserted in that square unless you actually click on it and be able to see it in the larger window above. This is very frustrating when I have to put them in sequence order as I just cannot see what they are unless I click on every single icon/square. I have attached two images, one of the faded out squares and one of a recently imported video that has no fade, but will become faded tomorrow. I am using Windows 10, just recently, but have been using Windows Vista for many years and still had the same problem on the Vista. PC specs - video card & monitor in particular? 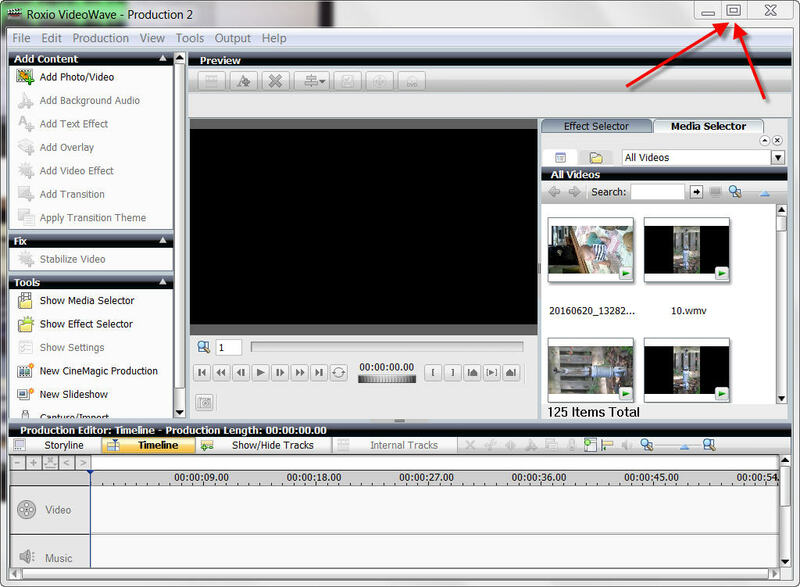 Any setting changes to Video & Monitor that are not Default? Same PC/Video combo in Vista & Win 10? What Version of Roxio Creator are you using (both cases)? 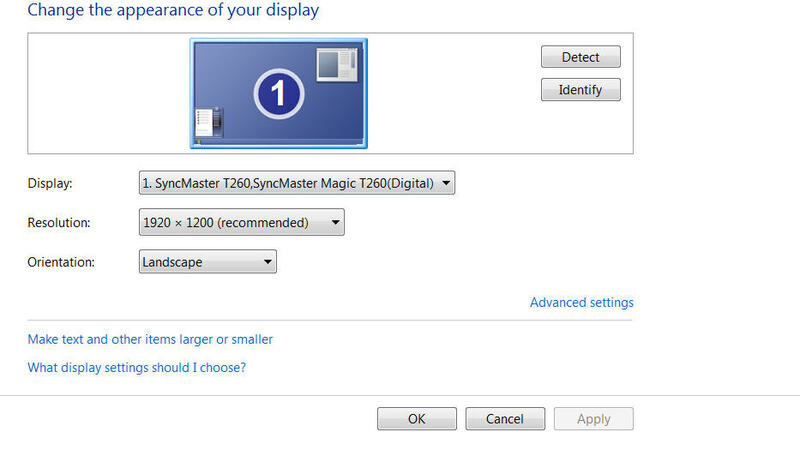 Monitor is an Asus K24HL 1920 x 1080p 24" (although I have tried different monitors and no difference. No setting changes have been made, all default. Just to add, I purchased the Roxio Creator NXT Pro 4, a few weeks back, as an upgrade to the Roxio Pro 2012, plus I was so frustrated with the RP 2012 fading out all the time, and this problem did not happen with the NXT Pro 4. However, I had to send it back as the program was nowhere near as good as the Roxio Pro 2012, as far as things it can do in Videowave. I was very shocked actually. Also noticing, that the windows in the Roxio programs are much smaller with Windows 10, they used to be much larger in Vista. 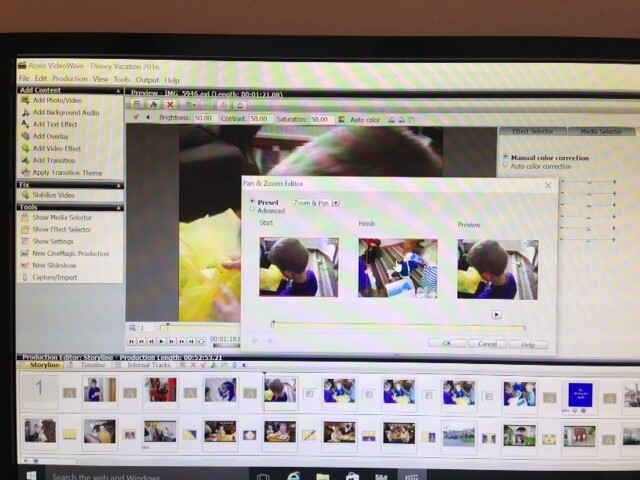 This is making it very hard to edit each photo/video as I cannot see them very well when the edit window comes up. I have spoken to Roxio CS about this and they do not seem to know why this is happening. I have tried to change the percentage to 150% and 175% on my monitor but this only touches everything else on the computer and only makes the WRITING in Roxio larger not the windows. Your correct C2012 is much better than NXT4 but NXT4 is the only W-10 certified version! Changing the DPI setting above 100% changes the software and should only be ran at 100%. How funny, it's the only W10 certified version yet the Roxio 2012 runs much better on Windows 10 and has much more available. Plus they both come up VERY small to work on. 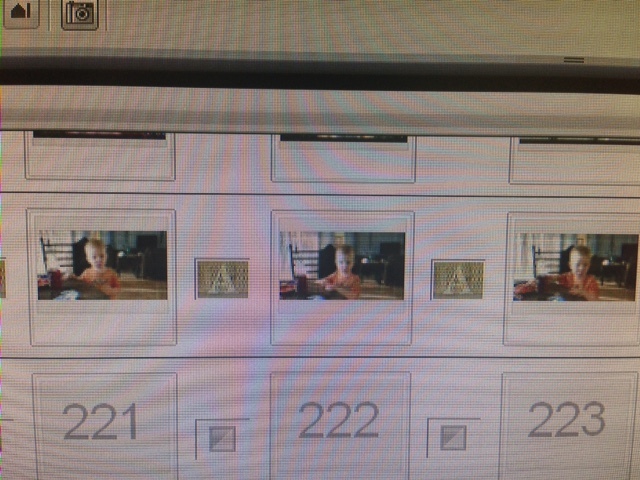 I believe if you delete the .dat file associated with your project, that will force it to rebuild the thumbnail images. CD is right on about the Display Settings! Stay with 100% and the orientation of Landscape. Thank you Jim_Hardin too for all your help. Still having problems with the scale of the windows in the Roxio Pro 12 though. 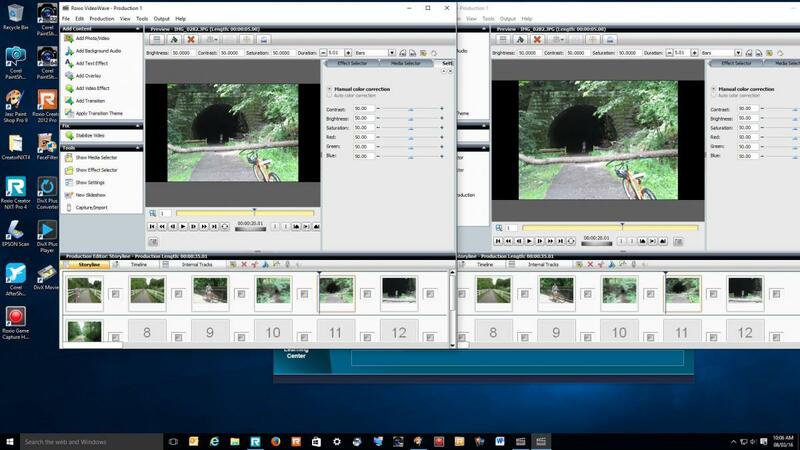 Using the program on Vista the windows are much larger, especially when editing music and pan and zooming, however, on my Windows 10, when I go to edit a photo/video the window that comes up is so small, I can just about work on it. I have attached two images. Thanks again everyone for your help. 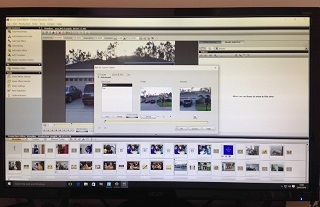 Do you have your window minimized or maximized? Control Panel\All Control Panel Items\Display\Screen Resolution?? Has nothing to do with DPI setting. Oh my apologies, yes, screen resolution is 1920 x 1080 on an ACER K242HL monitor 24" I was using a BENQ at 2560 x 1440 resolution and same problem, small windows. 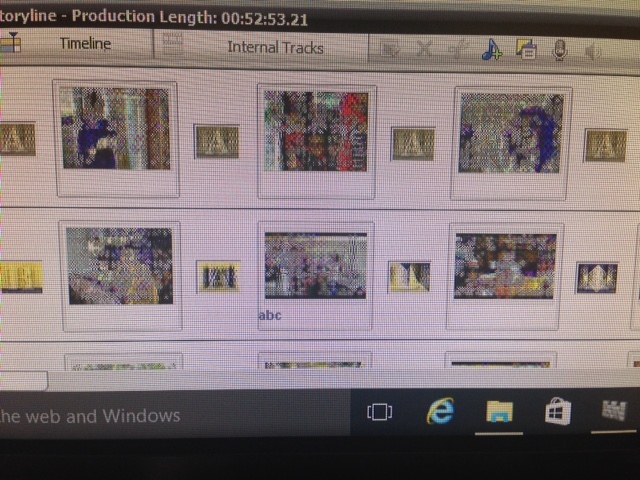 I must say about 10 days ago I changed the DP to 150% and the Videowave DID enlarge it's windows, however, after changing it back to 100% that night and trying to increase it again the following day, it DID NOT enlarge the windows this time, just the wording as you will see in the picture attached. I did speak to Customer Service at Roxio and they said it was a Windows 10 issue?? 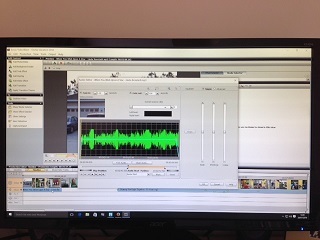 So frustrating as it's so hard to edit anything with such a tiny window to work on.